Career Expos are a great way to meet potential employers in an informal, easy, non-intimidating way. It offers you the opportunity to meet the ‘face’ of the organisation and really get an understanding of them in a way you can never get from just reading the recruitment material. The way in which employers engage with you at an expo can tell you a lot about whether their culture is a good fit for you. Were you able to speak to them easily? Did they treat you with respect? Were they enthusiastic about their work? Did you enjoy being with them? Could you see yourself working alongside them every day? Because of the casual nature of expos, many employers dress more informally at expos than they would normally do if they were at work. DO NOT LET THIS FOOL YOU! Expos are still serious business and some employers will offer interviews to students who have made an impression on them. Interviews are ALWAYS serious business. Never let yourself be misled into thinking you can approach interviews in a casual way. This doesn’t mean you shouldn’t be able to enjoy the interview, but it does mean you need to treat all interviews seriously. People are the organisation’s greatest asset. Hiring the right people is critical to the organisation’s success. Always show respect for the occasion by dressing appropriately. 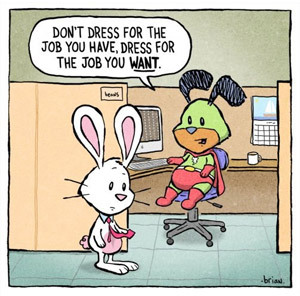 Depending on the job you are going for, the dress code can vary. However, even in workplaces with a more ‘informal’ environment, you always need to look smart and tidy. Heading off for an interview? Always check the dress code and when in doubt dress ‘up’ rather than ‘down’. Check with the careers staff if you are not sure. Even if you do feel confident, it’s a good idea to go over the preparations for your interview with careers staff to ensure you are on the right track. First impressions count! Get serious, and get that job!